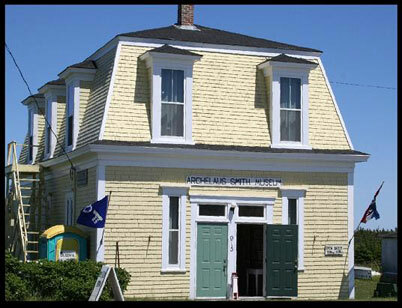 The Archelaus Smith Museum was named in honor of an early New England settler who has left many descendants. He was a community leader and, because he had a fairly good education, he was chosen as clerk of the proprietors. He also served as magistrate and surveyor. A religious man, he conducted services when there was no pastor. He has been described as a good and patient man. His contribution to the community makes him worthy of the recognition that has been given. Almost everyone on Cape Sable Island can trace their ancestry to Archelaus and his wife, Elizabeth. He could justifiably be called "The Father of Cape Sable Island". The museum building, located not far from where "Squire Arch" had his home, was orginally used by the Sons of Temperance and Knights of the Macabees for their meetings. Later it became the Centreville Community Hall. In 1970 it was purchased by the newly organized Archelaus Smith Historical Society. Devoted mainly to items connected with the fishing industry, the museum has grown to include artifacts from almost every aspect of island life.